Apple seems to have settled into a groove with a two-year update cycle for the iMac. The latest iteration of the company’s all-in-one desktop computer comes nearly two years after the previous release—and the 2017 iMac came two years after its predecessor. Updates to the processor, RAM, and graphics card are in the spotlight for Apple’s newest iMac; the rest of the machine remains unchanged. This review evaluates the 21.5-inch iMac with a 3.0GHz Core i5 processor. The standard configuration of this iMac is priced at $1,499 but the model reviewed here has the graphics card upgraded to the Radeon Pro Vega 20, which adds $350 to the price. Two of the 2019 21.5-inch iMacs are built around Intel’s eighth-generation Core processor, while the entry-level $1,099 iMac still uses a seventh-generation CPU. Our review unit has a 3.0GHz Core i5 processor with six cores and Turbo Boost support up to 4.1GHz. This is actually the first 21.5-inch iMac model to sport a six-core CPU. Previous 21.5-inch iMacs had quad-core processors, and the model a step below our review unit, the new $1,299 21.5-inch iMac, is still a quad-core computer. The two additional processing cores will benefit anyone who works in apps that use multi-core processing—usually creative professionals that use high-end video, audio, and imaging software, but many other professional-level apps, as well. If you’re one of those pros eying this iMac, you’re probably interested in the graphics card upgrade from the standard 4GB Radeon Pro 560X to the 4GB Radeon Pro Vega 20. As for external display support, the iMac can handle a single 5K display, or a two 4K displays. Apple decided to use faster RAM in the 2019 iMac, too. Apple now uses 2666MHz DDR4 memory, a small increase in speed from the 2400MHz DDR4 memory used before. The standard RAM configuration is 8GB (our review unit is configured this way). The RAM in the 21.5-inch models is still not user accessible, unfortunately. If you want to add more RAM later, you need to bring in the iMac to an authorized service provider. Or you can upgrade to 16GB ($200) or 32GB ($600) at the time of purchase. The 27-inch iMac has user-accessible RAM. We ran several benchmark tests to gauge the speed of the 21.5-inch 3.0GHz 6-core Core i5 iMac with 8GB of 2666MHz DDR4 RAM, and 4GB Radeon Pro Vega 20 graphics. We compared the results primarily to the 2017 model with 3.4GHz quad-core Core i5 processor with 2400MHz DDR4 memory and 4GB Radeon Pro 560 graphics, which sold for $1,499. When possible, we included benchmarks from other Macs for reference. Results are scores. Longer bars are better. Click to enlarge. In single-core testing, the new iMac provides modest gains over its 2017 predecessor. 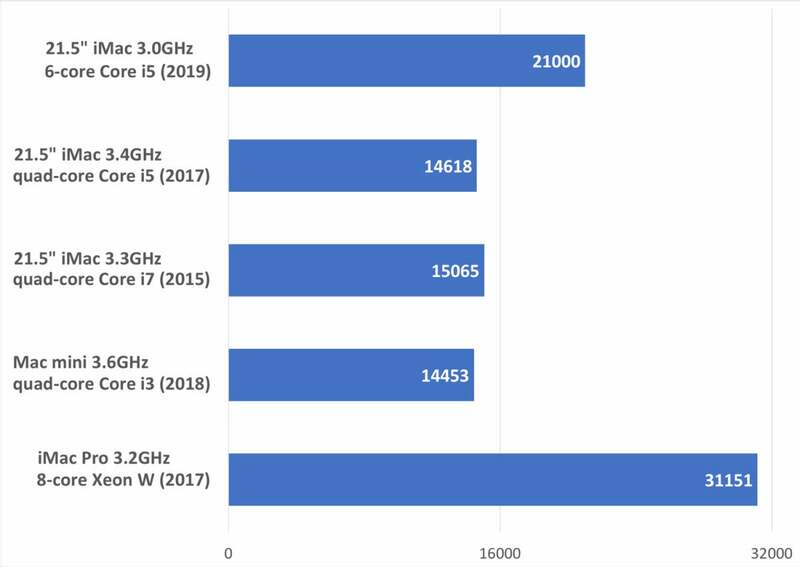 The 2019 21.5-inch 3.0GHz Core i5 iMac had a 7 percent boost over the 2017 3.4GHz Core i5 iMac. 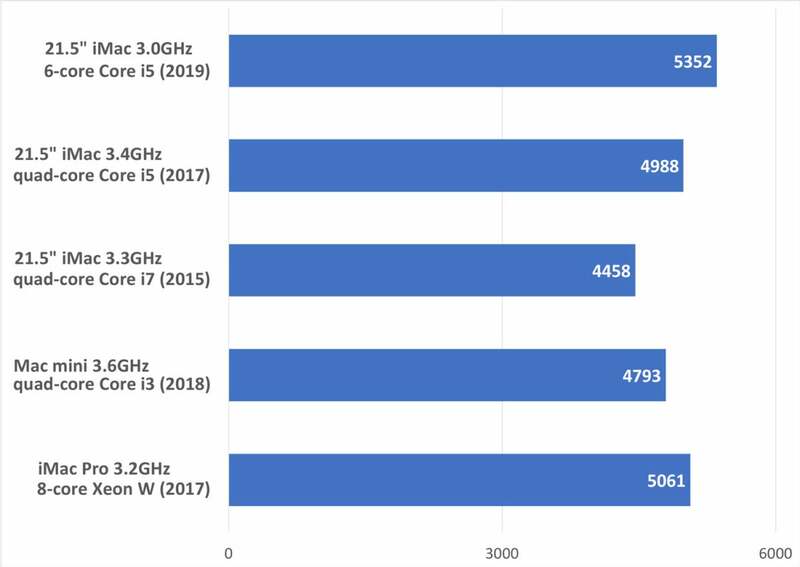 If you compare the 2019 iMac to the 2015 3.3GHz Core i7 iMac, the boost is a little more impressive: we saw a 20 percent performance increase. We also took a look at how the single-core performance of the new iMac compares to the current 3.6GHz Core i3 Mac mini ($799). 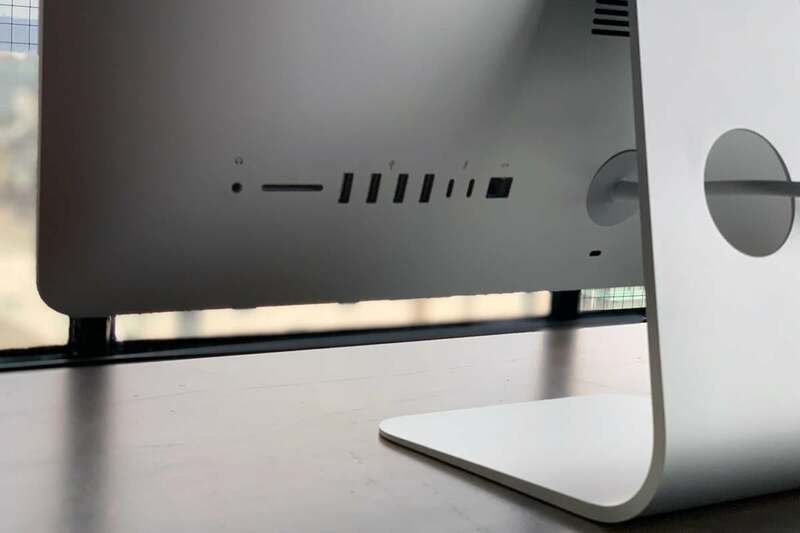 The iMac bests the Mac mini by 12 percent, which isn’t that surprising when you consider that the iMac’s faster Core i5 is up against the Mac mini’s slower Core i3 processor. What may be surprising is that the new iMac outperforms the base model $4,999 iMac Pro in single-core performance by 6 percent. Keep in mind, however, that the iMac Pro and its Xeon W processor were released in 2017 (so it’s due for an update soon), and single-core performance isn’t really its forte, as we’ll see in other test results. The new iMac also blew away the current Mac mini with a 3.6GHz quad-core Core i3 processor with a 43 percent boost. Compared to the 3.2GHz 8-core Xeon W iMac Pro…well, it wasn’t much of a contest. Multi-core processing is where the iMac Pro excels, and it was 48 percent faster than the new iMac. But overall, the new iMac’s multi-core performance is notable, and if you can’t spare the money for the iMac Pro, the new 6-core iMac offers attractive multi-core performance for the price. 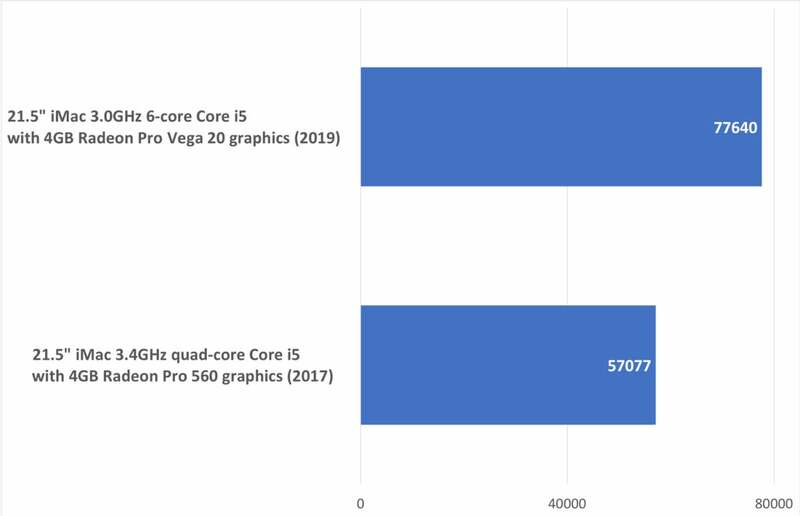 We ran a few graphics benchmarks to gauge the performance of the 4GB Radeon Pro Vega 20 graphics card in the new iMac. We compared the results to the 2017 3.0GHz quad-core Core i5 iMac with a 4GB Radeon Pro 560 graphics card. In these two tests, the Vega 20 provides a significant boost over the Radeon Pro 560. In the OpenCL test, the new iMac and its Vega 20 was 41 percent faster than the 2017 iMac and its Radeon Pro 560. In the Metal test, the new iMac was 36 percent faster. We ran several other tests on the new iMac and the 2017 model. You can see the results from testing with Cinebench and Blender here. The CPU, graphics, and RAM are the only changes in the new 21.5-inch iMac. The rest of the machine is the same as the 2017 model. Our review unit came with a 1TB Fusion Drive, which is standard on the $1,499 21.5-inch iMac. The Fusion Drive combines a standard hard drive with flash storage; the flash storage helps make the Fusion Drive faster than a hard drive, while the hard drive provides much more capacity at a lower cost than flash storage alone. If you’re waiting for Apple to make solid-state drives standard equipment on the iMac, you might have to wait a while (or opt for an iMac Pro). SSDs are still pricey, especially in capacities over 256GB, so Apple makes SSDs available as customizable options. The $1,299 and $1,099 models come with a 1TB, 5,400-rpm hard drive. The 21.5-inch iMac’s 4K Retina display remains unchanged from 2017. It has a 4096×2304 resolution, 500 nits of brightness, and support for the DCI-P3 color gamut. This display was actually new to the 2017 iMac, featuring increased brightness and support for 1 billion colors. It’s a vast improvement over the display used in the 2015 iMac. 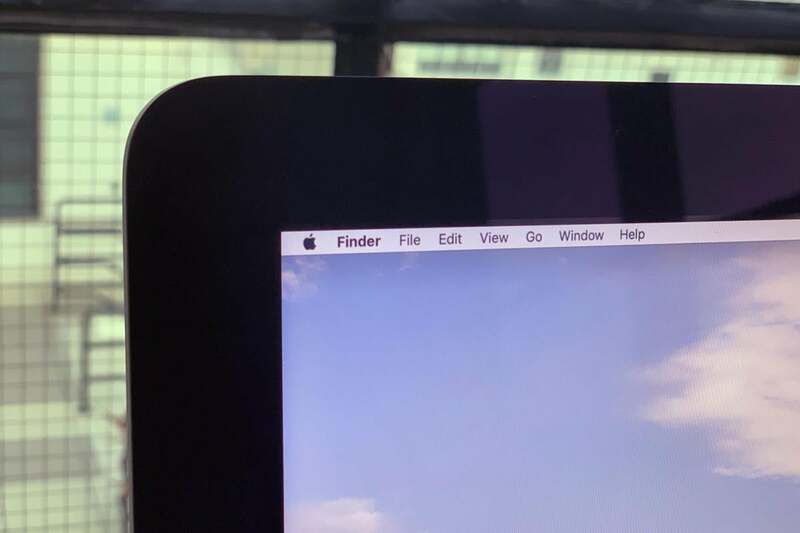 The port configuration hasn’t changed from the 2017 iMac. Behind the display are the ports, which include a headphone jack, a SDXC card slot, four USB 3 ports (Type-A), two Thunderbolt 3/USB-C ports, and a gigabit ethernet jack. There’s also a Kensington lock slot, and the stand remains unadjustable for height, though it does allow you to tilt the display up or down. Other features that remain unchanged: A FaceTime HD camera, stereo speakers, a built-in microphone, 802.11ac, Bluetooth 4.2, a Magic Mouse 2, and a Magic Keyboard. Finally, the design of the iMac itself hasn’t changed since it was introduced in 2012. (The aluminum design was actually introduced in 2007, but the thinner shape came in 2012.) While the design is definitely iconic, it may be starting to show its age. Seven years (12 years if you count the thicker version) is actually the longest stint for an iMac design. What especially stands out like a sore thumb about this design is the bezel, the black boarder that surrounds the display. It’s about an inch wide, and if you use modern-day MacBooks, iPads, or iPhones with thin bezels, the iMac’s bezel looks huge. Overall, there’s nothing functionally wrong with the current design, but a new design would breathe new life into the line. Macworld has a list of improvements we’d like to see in the iMac. In a world where bezels are shrinking, the iMac’s has stayed the same width for years. And relatively speaking, it’s pretty thick. Faster is always better, and the 2019 iMac is much better than its predecessor, especially with multi-core tasks. The model that we tested stands out as a possible price alternative to the iMac Pro, thanks to its 6-core processor and Radeon Pro Vega 20 graphics—components that pro users will appreciate. You don’t have to be a pro, however, to consider this iMac. At $1,849, (regular price of $1,499, plus $350 for the graphics card upgrade) it’s certainly priced right for the family or business.